This is the best kind of recipe: common ingredients combine to create a knock-your-socks-off meal (or starter). It’s bright and complex, without being overly spiced. 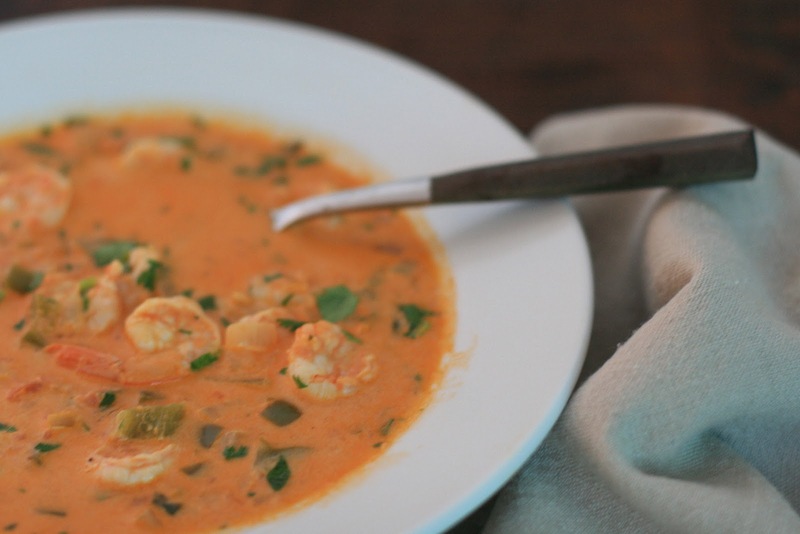 It’s also a good way to use up smaller- and less expensive- shrimp; I like being able to get spoonfuls that have everything, the shrimp, the pepper and onion and some of the flavorful broth. Combine the shrimp with the pepper, 1/2 tsp. salt, garlic and lemon juice. Cover and marinate for about 20 minutes. Heat the olive oil in a medium saucepan and cook the onion and bell pepper until softened. Add cayenne, a pinch of the cilantro, and the remaining teaspoon of salt and cook for one minute, stirring. Add the tomato puree and simmer until the mixture is thick, about 10 minutes. Stir in the coconut milk and bring to a boil. Add the shrimp mixture and cook until the shrimp are cooked, approximately 5 minutes. Stir in the remaining cilantro and serve.